What is the big deal with “sacrifice?” Why do humans believe sacrificing one's life means the sacrifice was worth more than life itself, when so many have died for what are obviously now recognized as evil systems, tyrannies, and failed isms? When did killing become sacred? What group of sadists originally came up with sacrifice as the solution for human problems? 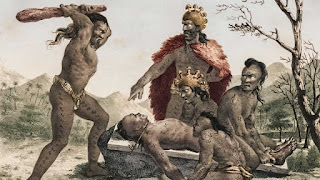 Of all the STUPID things the gods and their representatives have invented, human sacrifice has to be at the number one position.Of all the STUPID things the gods and their representatives have invented, human sacrifice has to be at the number one position. Why? It’s because so many lives were and are wasted. We can look back and conclude all the sacrifices to all the gods have not made any positive change to our environment, or betterment for our relationships in getting along together. All the slaughtering, all that suffering aimed at pleasing, wishfully expecting blessings from, and appeasing a god or gods and their anointed priests, could have been avoided. The immorality of human sacrifice is praised as the ultimate symbol of love and devotion! Why? Because, “they” claimed, it was what the god or gods wanted. One religion did a 180 degree: Its god sacrificed his son for humans, not the other way around. Or so “they” say. (If you call a state of suspended animation for less than forty-eight hours a “sacrificial death,” that is). If you accept this perversity as “love,” then you're gullible enough to accept what “they” say follows it: everybody owes his/her conscience to this deity, offered in the spirit of grateful self-sacrifice. This isn't only stupid and insulting to our humanity. . . it's way beyond bizarre. Big horrible, tormented, sadistic, friggin' deal. I won't waste another second of my life in “sacrifice” to anyone's adoration of wishful thinking for invisible hopes. I'm headed out to my house of hedonism worship, where I'll sacrifice a few ice cream cones for my friends and me. No one gets hurt.